The US treasury department released the 2016 Pension Plan contribution limits on 21st October, 2015 to accommodate inflation-adjusted figures. While there have been some changes to income phase-outs for a few IRA contributors and the limits for gross income have been adjusted; the bottom line of this year’s declaration is: There’s no more room for the savings of wage and salary types as well as the self-employed. For couples where an IRA contributor who is not covered by a workplace retirement plan but is married to someone who is: the deduction is removed if the couple’s income is between $184,000 to $194,000 (Increase from $183,000 to $193,000). The AGI phase out range for people contributing to a Roth IRA is now $184,000 to $194,000(Increase from $183,000 to $193,000) for married couples filing jointly. For singles and head of households, the phase out range is $117,000-$132,000 another increase from $116,000-$131,000. The AGU limit for the retirement savings contribution credit (also known as the saver’s credit) for low and moderate income workers is now $61,500 for married couples jointly (increased from $61,000), for head of households it is $46,125 (increased from $45,750) and $30,750 for married individuals filing separately as well as single contributors ( increased from $30,500). The Social Security Administration also declared earlier that the Social Security Wage Base for 2016 will remain unchanged at $118,500. The catch-up contributions limit for any employee who is 50 years or older stays the same ($6000) as last year. Even if someone doesn’t turns 50 until Dec 31, 2016 they can still make the additional catch-up contribution for the year. The limitations on SIMPLE and defined Benefit Plans remain unchanged as well at $12,500 and $210,000 respectively. 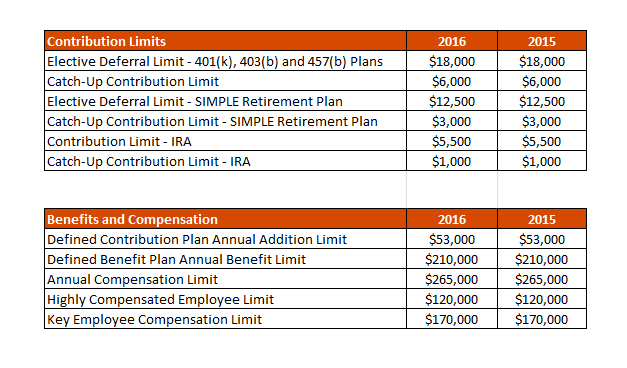 The Pension Plan contribution limits remain mostly unchanged for the year; however do access the IRS website to get detailed information on all the announcements regarding the 2016 Pension Plans. How Can Tax Professionals Be More Agile This Tax Season? 6 Reasons Why Your Business Absolutely Needs Sage 500 ERP Hosting 10 Places to Find CPAs and Accountants for Your Business Why Your Business Needs QuickBooks Add-Ons? The IRS did a bad thing this year. The savings contribution in most fields have remained the same while the cost of living has increased. They should be more considerate of the general public. IRS should have wedged in some room for the self-employed because the taxes for self-employment have been increased. This years plans are basically the same as last years. Makes a man wonder why the IRS guys dole out new plans every year if they want things to remain the same.